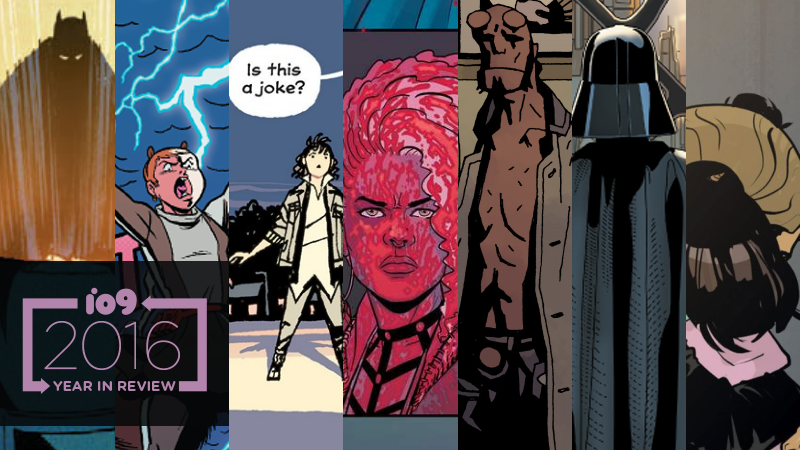 It has been a huge year for comics—so huge, we’re trying something a little different for io9's year in review. While next week we’ll be bringing you our favorite series of 2016, today is all about the individual moments: the panels and scenes that became our favorite moments to read in comics all year. Suffice to say, our picks may not be yours, so please add your favorites in the comments! Boom Studio’s Mighty Morphin Power Rangers book has done a great job of delivering bucketloads of Power Rangers nostalgia while still telling some really intriguing stories with the original Ranger crew that brings it well above the traditional nostalgia play. But it completely floored us with its latest issue with a major addition to the Power Rangers canon: an entirely new (and currently super evil) Ranger for the team to face off with. It was something we never expected the series to be able to do, and it pulled it off with an incredible reveal. Creative team: Kyle Higgins, Hendry Prasetya, and Matt Herms. Like much of DC’s Hanna-Barbera output this year, The Flintstones defied all of our expectations for a new comic based on the classic cartoon. Tackling modern issues (and a hearty dose of surprising angst) through the lens of the show’s prehistoric setting, it’s been playing with some heady ideas through the heads of Barney, Betty, Fred, Wilma and company. Perhaps the most absurd and intriguing comes in the book’s second issue, which both tackles the role of faith in Fred and Wilma’s lives, and the Flinstones’ bizarre take on animal commercialism, in ways you’d never expect from a Flintstones comic. Creative team: Mark Russell, Steve Pugh, Chris Chuckry, and David Sharpe. The ongoing Star Trek series’ final issues were a swan song for the franchise’s 50th birthday this year, bringing together the Enterprise crews of the Prime and Kelvin realities for an adventure that played with the typical crossover/alternate reality concepts. The story itself is fine enough, but it’s in the final moments, where the two different Kirks, in their different quarters on different versions of the Enterprise, look back at each other’s lives through personal logs that had been transferred between the two ships, where it really shines. It is Star Trek at its best, re-affirming the mission statement that regardless of the form it takes, or the universe its in, it’s all about that yearning to boldly go. Creative team: Mike Johnson, Tony Shashteen, and Davide Mastrolonado. The final saga of Scott Snyder and Greg Capullo’s run on Batman was dominated by the fact Bruce Wayne wasn’t actually Batman, asJim Gordon had taken on the mantle after Bruce’s “death” in a tale full of twists and turns. But it would never last—and while there was some tragedy in losing Jim as Batman, and Bruce Wayne losing the life he’d made for himself in a world where he wasn’t Batman, Bruce’s return was masterfully handled. Plus, you can’t beat a good bit of sassy Batman. Creative team: Scott Snyder, Greg Capullo, Danny Miki, FCO Plascencia, Yanick Paquette, Nathan Fairbairn, and Steve Wands. The Archie/Betty/Veronica love triangle is one of the most hallowed concepts in Archie history. But the slick “New Riverdale” reboot of the series that kicked off last year has given us an updated, heartbreaking twist to the triangle. The series began with Archie and Betty having mysteriously broken up, eventually leading to Archie and Veronica becoming a couple—but Archie #9 gave us an almost-romance between Betty again that, as always with this series, balanced a fine line between heartbreak and comedy that reminds us why we love this modern take on Archie and friends. Creative team: Mark Waid, Veronica Fish, Andre Szymanowicz, Jen Vaughn, and Jack Morelli. After teaching both the audience and villainous Count Nefaria the joys of counting in binary with her hands, Doreen uses her CompSci know-how in the climax of the issue, directing her squirrel armies to blast the villanous Venom with soundwaves in a splash panel so completely rad it looks like it’s ripped right of the cover of an early ‘90s metal album. Who knew learning could be so much fun? Creative team: Ryan North, Jacob Chabot, Rico Renzi, Erica Henderson, and Travis Lanham. DC’s one-shot special brought some majorly important revelations to the table, but Wally West’s return was one of the biggest. Teetering on the edge of existence, the pre-New 52's Wally spends the issue trying to convince his closest friend (and fellow Flash) Barry Allen of what’s happened to him, only to fail time and time again as Barry fails to remember who he is... until, just before all hope is lost, Barry finally rediscovers just what the first Kid Flash meant to him. Creative team: Geoff Johns, Gary Frank, Phil Jimenez, Ethan Van Sciver, Ivan Reis, and more. One of the big appeals of Paper Girls was its ardent dedication to the feel and aesthetic of its ‘80s setting. The Stranger Things before Stranger Things, it balanced weird adventures and that aesthetic wonderfully, and then proceeded to completely flip the script at the end of its first volume as the gang found themselves flung forward in time and space... only to encounter the grown-up version of Erin and find themselves stuck in 2016. The series has continued to be one of the best of the year, but this was easily a great “holy crap, what?” reveal to end the first volume on. Creative team: Brian K. Vaughan, Cliff Chiang, and Matt Wilson. Superhero comics—especially ones from the big two publishers—typically tackle contemporary issues one step removed from our reality, through a layer of “comic book-ness” that lets them both commentate and distance themselves. The excellent, short-lived Nighthawk series this year tackled issues of social justice as its African-American hero dealt with racist thugs and corrupt cops in Chicago, and never bothered with the typical step-removal superhero comics usually take. Its third issue directly dealt with the dark history of police brutality in black communities across the United States in a way that was frank and fascinating for a book from one of the biggest publishers around. Creative team: David Walker, Ramon Villalobos, Tamra Bonvillain, and Joe Caramagna. The cycle of the gods and their future has long been solidified in WicDiv, but issue 22 changed the game forever, taking the series into some intriguingly uncharted waters. After discovering that Ananke—the woman who has guided each generation of reincarnated gods for thousands of years—has been setting the gods against each other and manipulating them, the pantheon unites against her, and in a stunning moment of weirdly beautiful, super-gross violence, Persephone kills Ananke. For the first time we know of, the gods get to choose their own fate, and it’s fascinating. Creative team: Kieron Gillen, Jamie McKelvie, Matthew Wilson, and Clayton Cowles. Although there’ll be future comics with the character, Mike Mignola said goodbye to one of his most famous creations this year, and it wasn’t a moment that found its power in spectacle or massive action, but one that focused on quiet introspection and simplicity. Hellboy doesn’t utter a single word in the issue, as the conclusion folds in around him. Instead, he gets something comic heroes rarely get: the glory of a well-earned rest. Creative team: Mike Mignola, and Dave Stewart. This year we bid farewell to Marvel’s stunning Darth Vader series, which has done a lot to reinvigorate the vision of Vader as a chilling, brutal force of nature. But it also gave us some gleeful moments of Vader delivering some of the best one-liners in comic history—case in point, the moment Vader personally escorts the corpse of an agent of the Emperor he killed to Coruscant, dumps it out in front of his master, and then demands a better standard of backstabbing from him. Hot dang. Creative team: Kieron Gillen, Salvador Larocca, and Edgar Delgado. It’s been a good year for Batman in the comics. The conclusion of Scott Snyder and Greg Capullo’s seminal run on the character gave way to an era under the auspices of writer Tom King that’s given us an equally interesting interpretation of Batman. The current arc, focusing on Batman and his relationship with Selina Kyle, gave us an emotionally devastating addition to Bruce’s origin story that made us re-examine the way we fundamentally view Batman as a character. To boot, it was a moment delivered over some truly stunning artwork from Janín, Hugo Petrus, and June Chung, who have been hitting out of the park on the series. Creative team: Tom King, Mikel Janín, Hugo Petrus, June Chung, and Clayton Cowles. It’s been a sparse year for Saga fans, but the conclusion of the sixth volume is one of the emotional highlights of the entire series. Having separated Alana and Marko from their child for the entire volume, the moment where the family finally comes together again is simple, but beautifully done. Even if you aren’t a parent, it’s enough to get the waterworks flowing rather liberally. Creative team: Brian K. Vaughan, Fiona Staples, and Fonographiks. Look, if I had my way, I could fill this whole list of moments I loved from The Vision. But if there was one moment above all to highlight from this engrossing, haunting, superhero Shakespearian tragedy, it’s the parallels between Viv Vision and her mother Virginia in The Vision #4. The shared use of the line, only revealed in full during the climax of the issue, is a masterful moment of plotting, as its meaning (and relation to the Vision family’s synthezoid ability to allow objects to “phase” through them) takes on two, equally tragic airs that set Virginia spiralling even further down a dark path of destruction. Creative team: Tom King, Gabriel Hernandez-Walta, Jordie Bellaire, Clayton Cowles.